devastating Katrina three years ago, as had been feared, it still refocused attention on the Gulf Coast&apos;s protection from big storms. Officials insist New Orleans is safer now than it was then, but even with more man-made protections on track, nature&apos;s own floodwalls need to be erected, too. In the years since the hurricanes Katrina and Rita devastated New Orleans, the Army Corps of Engineers, along with its partner agencies, have committed $14.6 billion to repair and upgrade the region&apos;s hurricane defenses. Amanda Jones, spokeswoman for the U.S. Army Corps of Engineers, New Orleans District, said the areas compromised during Katrina have all been repaired as of June 1, 2006. She said, in addition to levee improvements, several modernized floodgates have been installed and tested by the Corps, offering a higher level of protection against storm surge than existed in 2005. 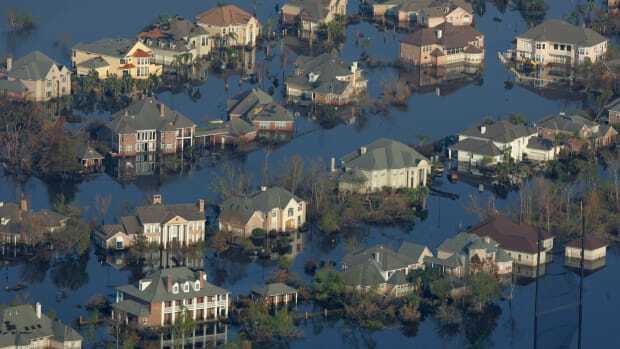 "The levee system is in better shape now than it has ever been," said Chris Macaluso, a spokesperson for the state of Louisiana Hurricane Protection Office. That said, Jones confirmed that the work required to raise hurricane protection levels to withstand the once-in-a-hundred-years storm is not scheduled for completion until 2011. Macaluso said improved infrastructure alone will not provide absolute protection — the region must also consider the critical needs of the coastline. "There is a crisis of coastal erosion in Louisiana, and that contributes to the risk from storm surges," he said. "Over the last century, we lost about 2,300 square miles of coastline through erosion and coastal subsidence," while hurricanes Katrina and Rita alone washed away 217 square miles of fortifying coastal wetlands. "We&apos;re losing a football field worth of land every hour," Macaluso added. The coasts are "essentially in the same situation they were in as Katrina approached." This environmental tragedy contributes to the human tragedy, since restored wetlands could add storm surge protection. Macaluso said every two miles of wetlands that serve as a buffer could reduce storm surge by as much as a foot. "The bottom line is the cities and the infrastructure are much more vulnerable than they were a century ago when the wetlands were more extensive and more healthy," he said. One study, headed by Robert Costanza of the University of Vermont, has put a specific annual value $23 billion of storm protection services from existing coastal wetlands. The message seems to be getting through, at least to coastal residents if not policymakers. "Both coastal erosion and loss of wetlands are on par with gasoline prices (at a time of record prices) and even higher than the economy or crime as the most serious problems facing their area," according to a poll of coastal Louisiana voters released Aug. 18 by a Democratic and a Republican polling firm working together. "The vast majority see hope for southern Louisiana," the pollsters related, "as they believe that wetlands and coastal areas can be restored and protected. Fully 85 percent say that wetlands can be rebuilt, and 76 percent say they can be protected." Still, in some quarters, the protection issue has become a levees vs. wetlands battle, although policymakers seem to understand the need for balance. Macaluso noted in 2007 the state of Louisiana approved a master plan committing $1 billion for both levee protection and coastal restoration. He said the plan calls for a host of large coastal ecosystem-restoration projects with the goal "not of restoring everything that has been lost but of reversing the trends that have caused those ecosystems to begin to degrade." Using resources already available, such as dredge spoil from navigation channels or large-scale river diversions, the state hopes to restore life and real estate to disappearing shorelines. And it&apos;s working. Macaluso said diversions of freshwater from the Mississippi River into marches of Jefferson and Lafourche Parishes in Louisiana are beginning to spur signs of recovery, encouraging the growth of aquatic plants and native vegetation. Nevertheless, if Gustav approaches as a dangerous storm, surely, upgraded flood prevention systems will help protect life and limb and property. The long term future, however, of New Orleans and the communities in the region will require not just a good supply of reinforced concrete and steel but also equal care for swamps, grasses and dunes. "Levees are a necessity in Louisiana simply because of geography," Macaluso said, "but those levees can&apos;t exist by themselves. Wetlands have to be considered as central parts of any hurricane protection system."